The scarf looks beautiful! I'm glad I got to see it in progress in person before you gave it away. Great job! 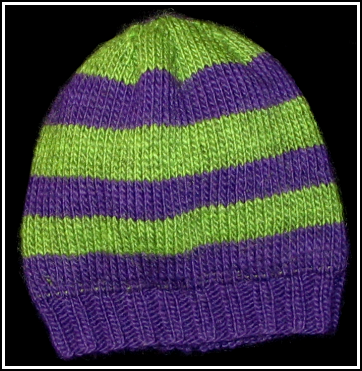 I love that purple and green hat. 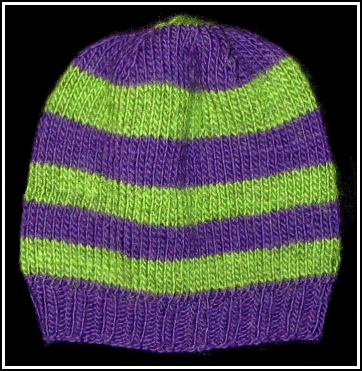 I need to track down that color combination to do a Rad Bad Beanie...great stuff. Love the scarf too...I am with you I am only knitting for those who truly appreciate it. Love the hat. I'll bet it will be warm. 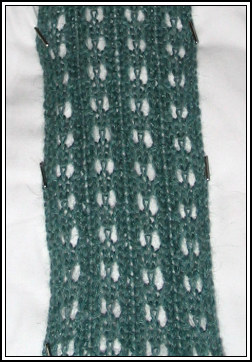 The ribbing is normal knitting and not double knitting? I no longer knit for anyone but me. And the cat. EVER. Period. The hat is so cool, love the colors you chose. As for the scarf, it's pretty, but maybe a little too long. Perhaps I've seen to many horror movies. Nice job on the scarf and the hat! They both look great -- and I'm glad your sister-in-law was appreciative of the gift (I find that most people are, but sometimes people just don't get it. Argh.) Like you, I've only been knitting a short while, too, but I also can't imagine life without my knitting. I LOVE that hat! It's so cool and bright and fun and.. and... and it Cool and Bright and Fun. *grins* You get the idea! It's great!